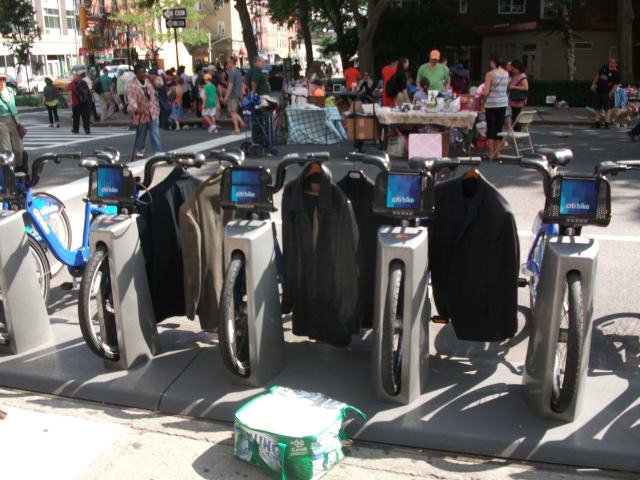 Bike share kiosks are great for bikers, but do little for the other residents of the blocks they are on. 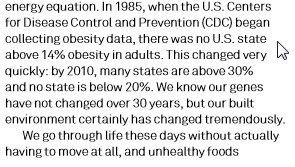 This is not very different from the old car-centric model of street use that they are replacing. 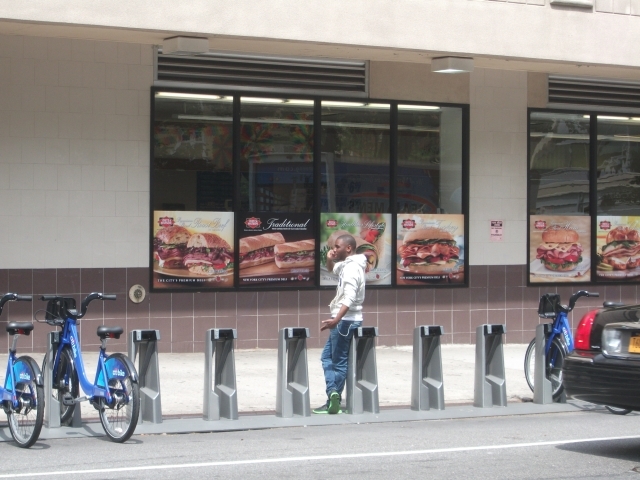 What if bike share kiosks can be transformed from spaces solely for bike share riders to community spaces that benefit all who live in a community? 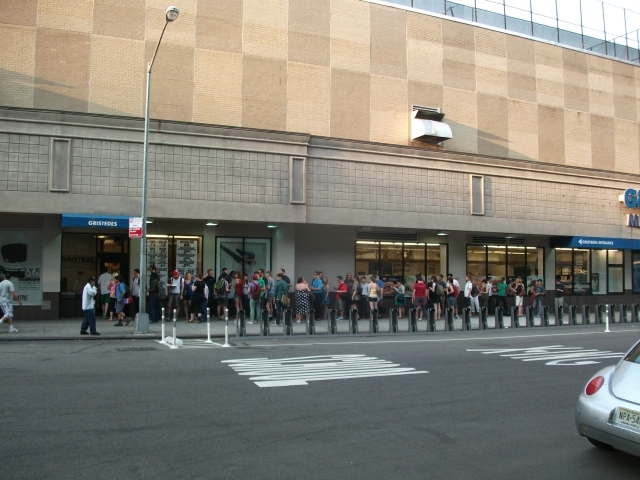 This was taken before the Citibike opening at the 7th Ave Whole Foods Citybike Station. 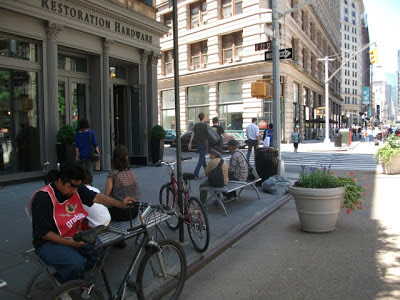 The guys on the left and right were both using the Citybike Stations as a sidewalk cafe. 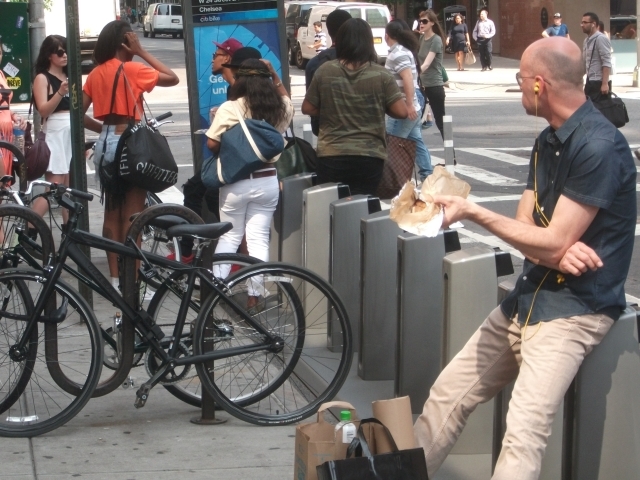 Here's two people sitting and eating on Citibikes. 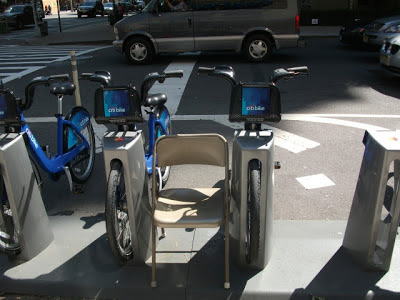 What the above photos show is that given the lack of enough conveniently located outdoor seating in our neighborhood , residents have decided to repurpose the Citibikes and their docks for seating. This is a great use. Essentially the 300+ Citybike docks have now become 300+ conveniently located de facto parklets. 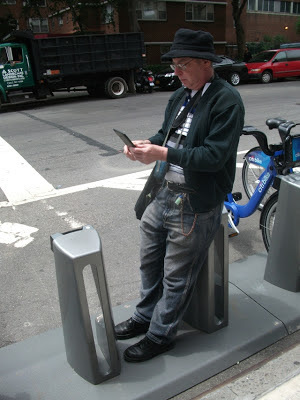 However the seating and eating capabilities of the Citibike stations are not ergonomically up to snuff, especially for older people. With some low cost additions, these bike share stations can be transformed into real Parklets to better serve all community residents. 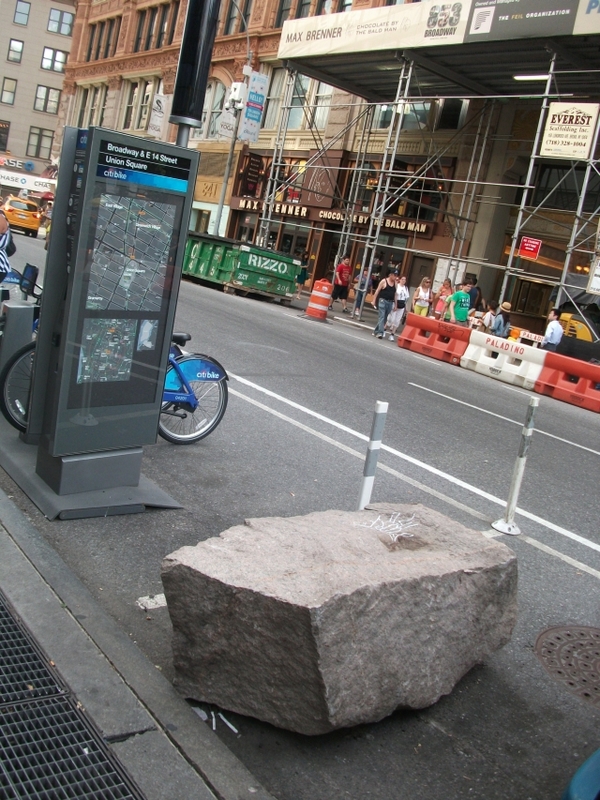 See the rock in the photo below, I assume it exists to stop the Union Square Citibike station from being backed into by a car. These folks are using the station's rock as a bench. This is far more Age-Friendly seating than leaning on the docks or sitting on the Citibikes. As at this location, placing a rock at a bike share stations has already being done at some other locations. 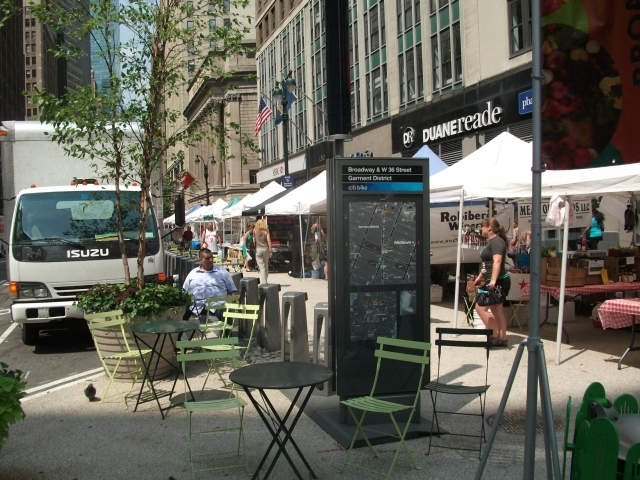 These stations can be considered full fledged parklets with limited seating as opposed to de facto parklets. Other Citibike stations without adjacent seating areas can easily be transformed into parklets by the simple addition of a rock, without having to have any new design approved. In between the bike's there's actually enough room to place a real seat as I did here. And here's one of our neighborhoods who when I did so, let me know it was a great idea. Citibike is going through through startup shakedown at the moment so I don't think it's the time to add seating between the docks. However it is the time to have a design competition to come up with ideas on how best to implement seating at bike share stations in the future. These are 3 Parklets, that share their space with bike parking. 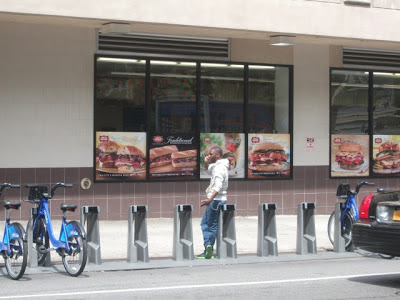 No reason that Bike Share Kiosks's can't return the favor! This Unified Public Spaces Map shows the outdoor public spaces with seating of NYC's Chelsea neighborhood. 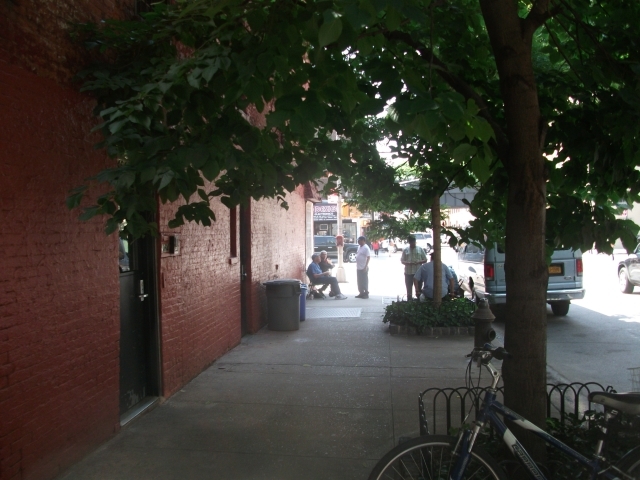 There are locations, especially in south east Chelsea, where residents have to walk more than 3 minutes to find an outdoor seating location. The red dots are bike share stations , by adding seating to each of these bike share stations it will help assure that there is outdoor seating within a 3 minute walk of all residents of this community. 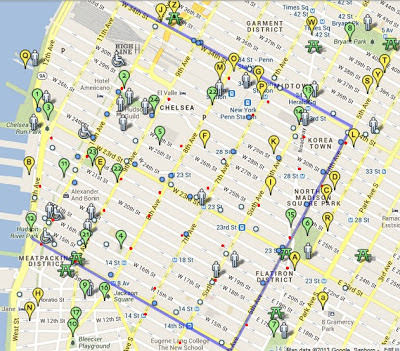 "For most park users, the most common activity is sitting"
This map shows the Public Libraries of mid Manhattan. The east side has a lot, see the West Side, there aren't many there. Add seating to the Citibike stations, plus books storage and we'll have outdoor reading rooms (or as I like to call them Read-Fi Hot Spots) on our blocks. There's a concept called Little free Libraries , thousands of these have been installed over the world. 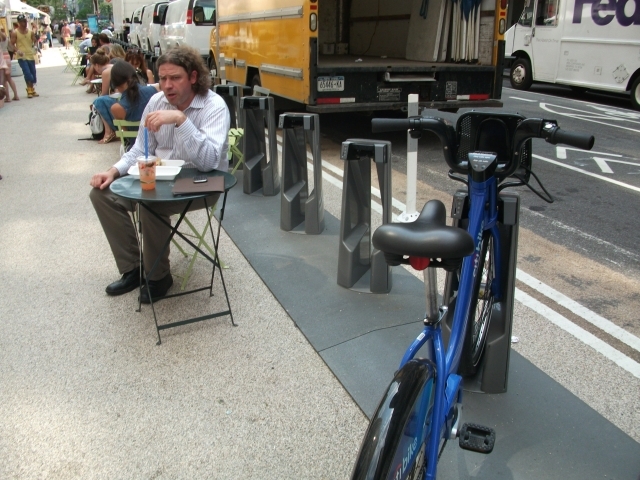 In this simulation, this person is enjoying a cup of coffee in a Citibike Parklet. 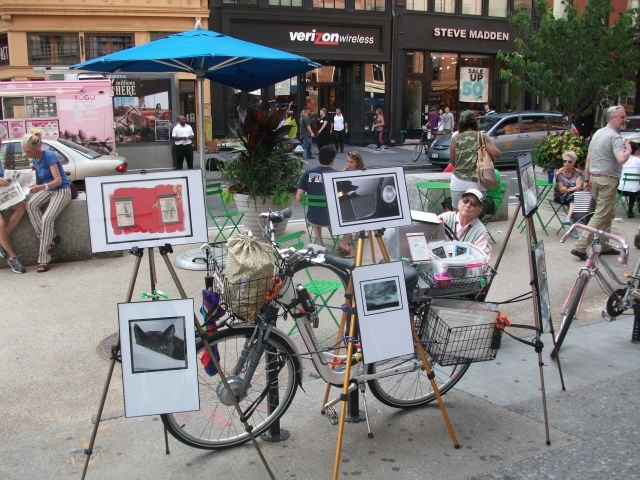 To her right is a 3 draw cabinet with magazines , transforming the parklet into an outdoor reading room. .
"Residential proximity to parks is a critical determinant of park use and leisure exercise." One of the factors in this low turnout is that people have to go to the gym. 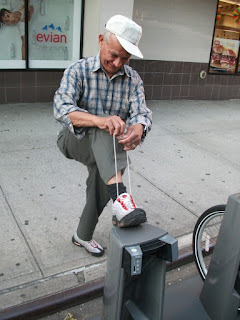 What if we place fitness equipment on our streets and sidewalks so that there is no more "going to the gym"? "Community Board 4 has the lowest number of Community Gardens"
Often the Citibike Kiosks on West 26th Street/8th Ave , has few or no bikes in them. Adding a community art exhibition to these empty spaces transforms them into a community art gallery. This sculpture is actually a protest against Citibank sponsorship, of Bikeshare. but it also a really good representation of the concept of placing a work of art at a Bike share dock. Rock seating at bike share kiosks is limited in the number of people that can be seated and has other limitations. Here's more ways to add additional seating to kiosks. Using computer aided design, more complex shapes can be created that can add more than seating to a dock. Here's one example. Adding a table to the dock seating greatly increases its functionality for users. Should the table be separate or integrated with the seating? 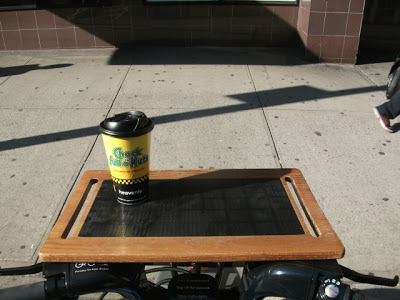 This table/chair combo shows how it's possible to create a shape that can be molded to fit the Citibike docking stations. Softwalks adds functionality to sidewalk sheds, could a modified version add seating to Citibike stations? Would a folding seat at the docks be better than a fixed seat? Nancy Bruning has created a system Nancercize: 101 Things to Do on a Park Bench. In it she shows 101 exercises to do on a park bench. My neighbor, Adrienne Robbins, demonstrates one possible Citicize dock exercise, and she has volunteered to create a series of exercises for the docks. 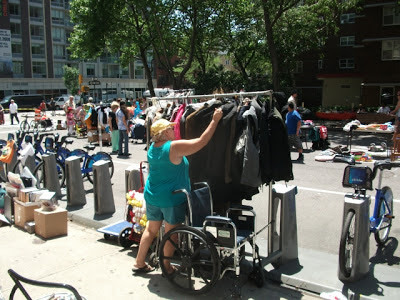 The Penn South Flea Market was held on June 1st. 2013 The Bike stations on 26th Street got new uses on that day. Moving the Kiosks from a space exclusively for Citibike users to a shared space model will also benefit Citibike Users here's how. 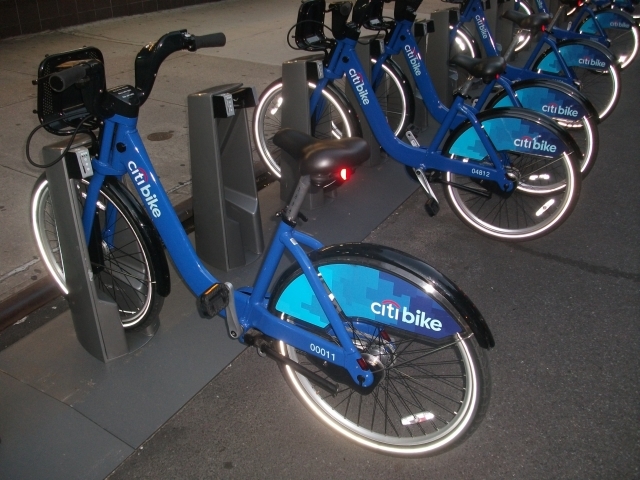 Citibike stations powered by sunlight are experiencing a problem of not enough power. Some stations run on solar power, which the New York Post reports doesn't work very well in the rain or overnight. Others run on batteries, the New York Times notes, which means that on nice days, "the sun can help sustain a station, but ideal riding conditions beget heavy use, which can drain batteries." Voltatic Systems figures the cells are generating a maximum of 210 watts . They also show a solar bikeshare system in Montreal that can be powered with 30-40 watts. So I would guess somewhere between the two numbers would power our system. 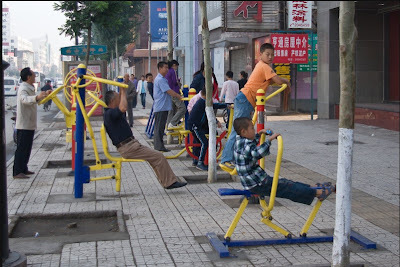 -Neighborhood residents get free use of bike exercise equipment, without having to "go to the gym". Equipment in turn charges Citibike battery. - If a Citibiker still finds a station without currently enough power in battery to run station, Citibiker can always use fitness equipment for a few minutes to charge the dock. So the technology exists, but, just like everything else in New York, it all comes down to money – something that, right now, Citi Bike says it’s fresh out of. “I’d guesstimate each [generator unit] would run around $350,” Maschmeier told us. Of course $350 x 6,000 (the number of bikes in the bike share program) is well over 2 million bucks, so installing generators on every single dock is probably a longshot. 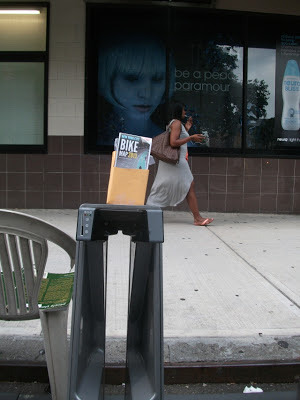 But what if only one bike dock per station was equipped with a generator? With 330 stations (the current count), we’d be looking at about $115,500 to install one generator per station. Or, generators could be installed only at the stations that need a little extra juice (remember that some riders have been complaining that solar-powered Citi Bike stations oftentimes don’t work on cloudy days). According to Maschmeier, the system’s credit card machines don’t use much power, so it would likely only take one person pedaling for about 30 minutes to store enough charge in the battery to keep the station up and running for the day. Half an hour spent pedaling on a stationary bike may sound grueling to some, but let’s not forget that some people are already doing it just for the sake of their figures. 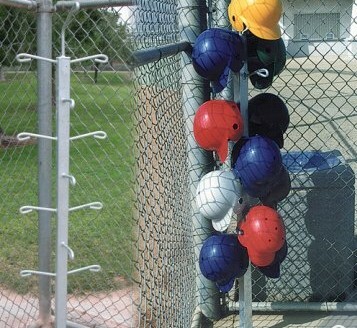 Locking the helmet at a parking pole near a dock ,Advantages: this can be done now, disadvantages: ,to do this you must carry both a lock and cable, probably no more than 2 helmets can be easily placed on a single pole. Flexible cables would be added to the loops. 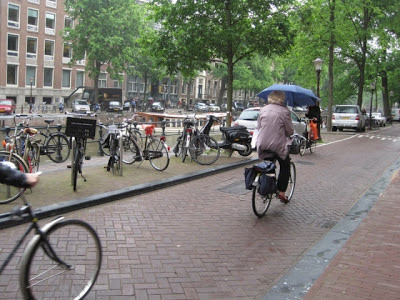 You can then lock your helmet to the pole at a station and retrieve it on your return trip,. No longer must you carry it around with you. Madison's first bicycle rest area was installed on the Capital City Path near its junction with the Yahara River Parkway Path. The rest area has two benches, bicycle parking for 5 bicycles and a bicycle repair station including an air pump. Across the path is a water fountain and a map of area bicycle facilities. Citibikers need rest stops too. 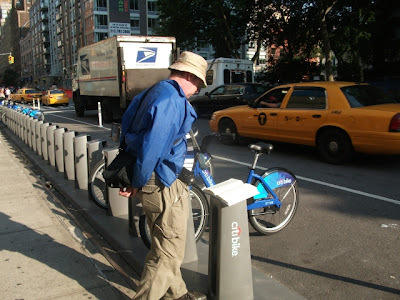 Where a Citibike Kiosk is adjacent to a park, Citibikers have easy access to a place to rest. 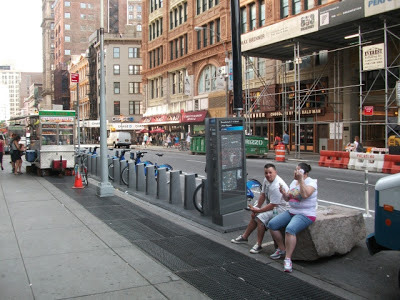 Adding seating to the docks could turn most Citibike Kiosks into bike rest stops for both Citibikers and non Citybikers..
On top of the Citibike Docks. 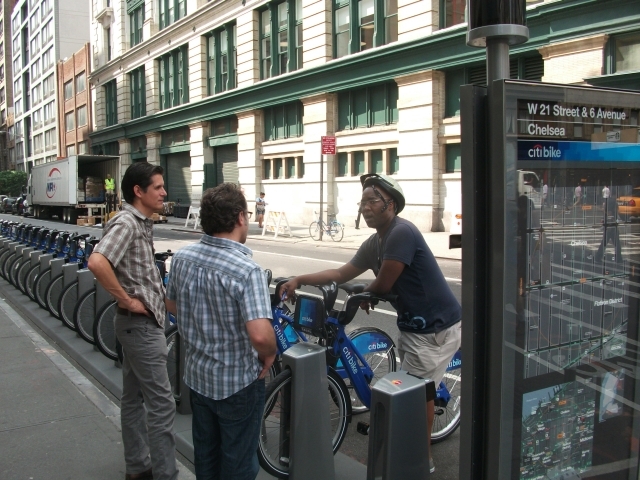 Rules for the use of Citibikes can be placed so that Citibike users can better learn the rules. 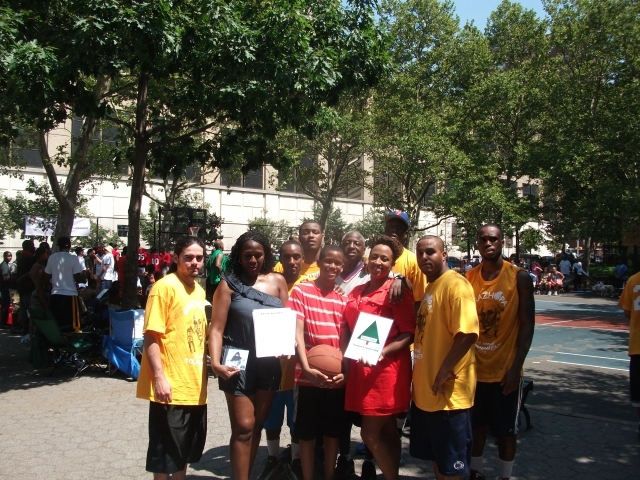 Block events happen on a regular basis in our neighborhoods. Unfortunately there are few places to legally post notices of these events. 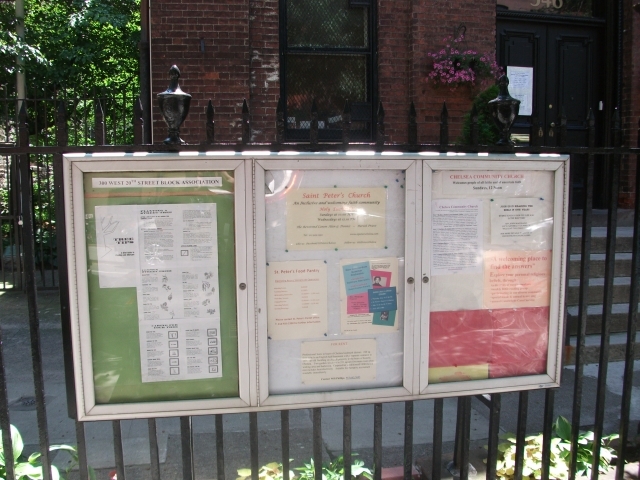 A single panel community bulletin board can be placed in the space between the docks. Every minute you walk can extend your life by 1.5 to 2 minutes. By adding real seating at the docks it gives walkers a comfortable places to rest. The addition of other functionality like the outdoor reading room materials, something to do while resting. This printable Park Chelsea map lists all the publicly accessible walking rest stops in Chelsea. The red dots are Citibike docks, adding seating to them would transform them into walking/wandering rest stops. During Hurricane Sandy, with electricity gone, communications was down in much of lower Manhattan. Citibike kiosks have internet access, are powered by solar( and I'm suggesting they be powered by pedal power too). Add a epaper screen internet display to them and during an emergency with no electricity these stations could double as communications between the city and residents.Add a cellphone charge adapter and the hubs become cellphone charging stations during an emergency. 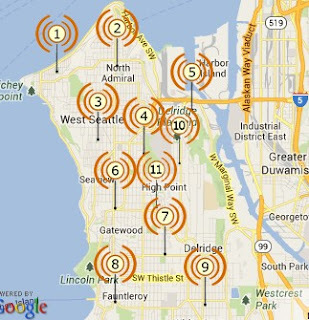 The West Seattle Emergency Communication Hubs are our emergency community gathering sites in case a major disaster occurs that makes it impossible to get information and help in the usual ways. In an emergency West Seattle residents have to be able to shown on a map(above) where their emergency hubs are. 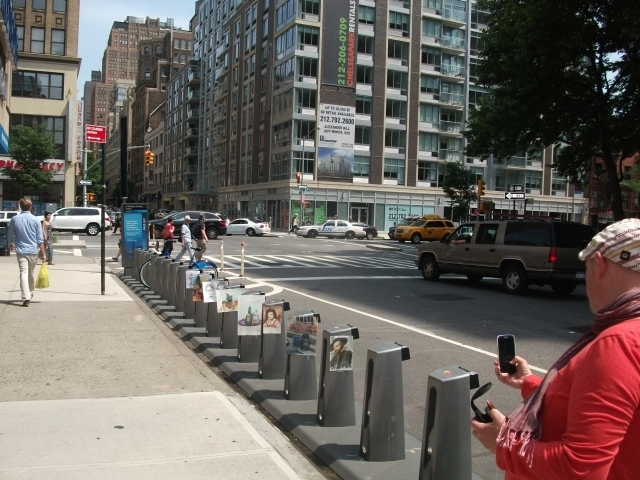 In areas of NYC with Citibike docks all you need to do is let people know to go to their nearest Citibike Dock. Adding a Wi-fi hotspot to Citibike kiosks, plus seating will allow neighborhood residents to spend more time outdoors surfing the web, rather then indoors. Solar power the WiFi and it becomes part of the neighborhood emergency communications hub mentioned above. Bioswales absorb water. During storms, they can absorb water rather than the water overloading our sewage systems. There is an area in each Citybike station that is a buffer between it and the rest of the street(lower left corner of above photo).First off, I have almost tripped on the low white object a number of times now. Not good. Something more visible must replace it. One thought if we transform it into a bioswale it can help the city in it's quest to substitute green sewage infrastructure for building new gray sewage infrastructure. Doing this can save the city tens of millions of dollars in construction costs. 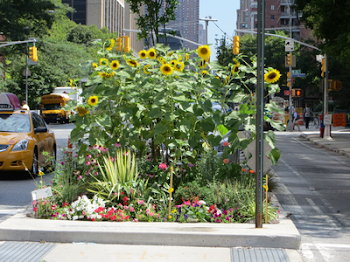 While the Columbus Avenue bioswale’s performance during stormy weather has yet to be assessed, the DEP said that their bioswales (they warned that the building specifications, and therefore performance, of other bioswales may vary) soak up 2,244 gallons during storms. Freecycle -. It's a grassroots and entirely nonprofit movement of people who are giving (and getting) stuff for free in their own towns. Hinged this will flip down when not in use. 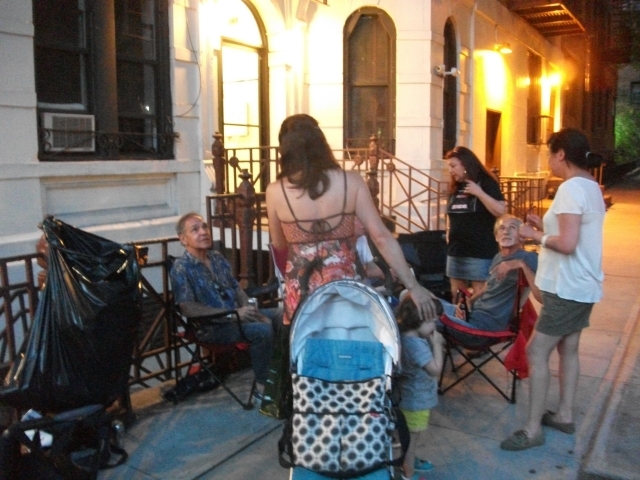 On W 25th St at 10th ave, a group of seniors like to bring out chairs and sit and talk. The Citibike Parklet could have seating to allow this to occur. I've been to the community office of my local City Council Rep. There are two tables in the office with all sorts of handouts from all sorts of City agencies. Most community residents, never get to the office. A City Gov literature rack at the kiosks would allow agencies to leave handouts to the community at the docks. An article in the NYT talked about the use of Citibikes as backwards spin cycles. . I checked and found another article in the NY Times that says it's useless as exercise, which wouldn't matter because it seems fun, but the article also said it may also cause injury so I wasn't gonna include it on the list until I learned more. Then I viewed this flashmob video from London where the bike shares there were transformed into forward spin cycles. 6/26/2013 update: Turns out this is creating some jobs. Today I ran into a Ciibike employee Guy on 21st and 6th Ave. He has a territory from 6th to 9th ave, Street. His job is to help people with Citibike questions. In the short time I was there he helped about 5 people. he is one of 20 Citibike employess with this specific job. Citybikes provide jobsThe city bikes are maintained by Incita, a local non-profit organization using the citybikes to train and support hundreds of rehabilitees every year. The program is a succes. I can't believe I got to #37 before adding this use. The 300+ Citibike kiosks already meet this maxim for bikers. With the change of 1 one word they could do so for everyone. Given the space between most docks, designing custom seating to fit should create the best designs. In some cases there is no space between the docks (21st and Broadway for instance). 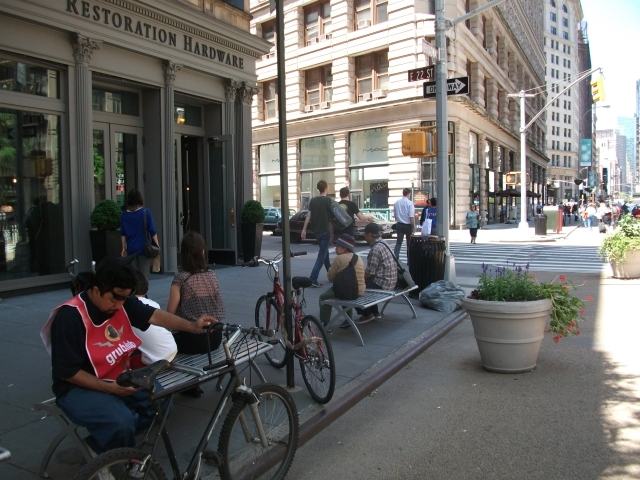 Here the Flatiron Partnerships benches are in the adjacent plaza. In other locations Citybenches can be placed on the sidewalk adjacent to the docks,to create rest stops for bikers and microparks for everybody else. The Citibike docks also help put retired people to work. Yesterday I saw this fellow try to help a neighbor of mine dock a bike that wouldn't dock on 26th at 8th Ave. 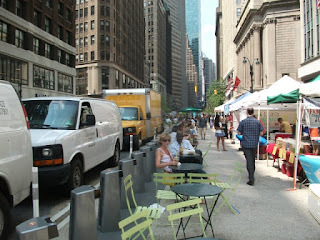 Throughout Manhattan you'll find bollards in front of buildings. 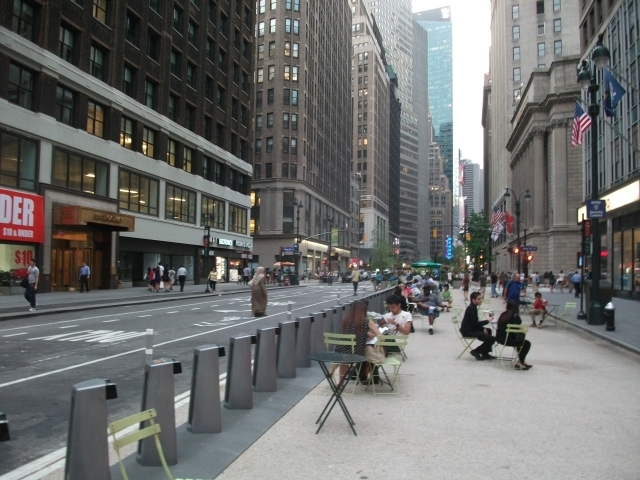 What about replacing the bollards with Citibike docks? 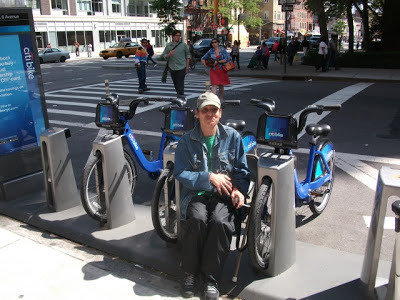 “There is a need for bathroom accessibility and downtown businesses have been crying out for them for a long time,” Williams said.
. Citibike pays local business X dollars a month to open their restrooms to Citibike users. Restrooms are open by your Citibike key. 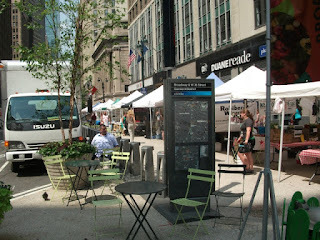 At Citiparks that are in plazas or near parks without restroom. install a restroom adjacent to them, if no restroom currently is at the location. I checked with a Porta John company. These can be installed at a cost of under $2,000 a year. That means 20 of them can be installed in City parks throughout the Citibike area for $40,000. Considering Citibike memberships are now taking in $5 million dollars a year, they can easily afford to pay for this. The problem is can the Porta-Johns be placed in the parks? Fit City 8 was held on June 24th. One of the NYC Commissioners made the comment that CemUSA is required to install 20 public restrooms in NYC, trouble is no one wants them and they have only been able to install 4. Now these automated restrooms cost more than $100,000 each. So we're talking 1.6 million dollars worth of uninstalled restrooms. Assuming the restrooms havn't been built yet reallocating the 1.6 million would pay for a LOT of locations offering to open their restrooms if paid $200 a month. 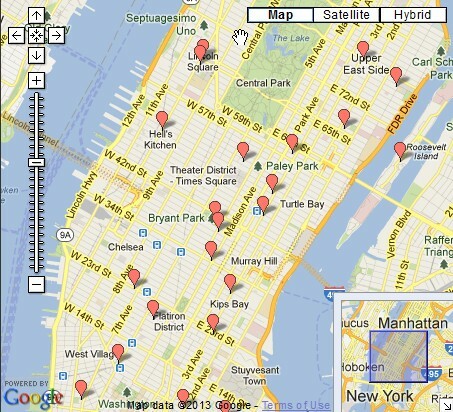 I have created portable neighborhood open space maps for several Manhattan neighborhoods. 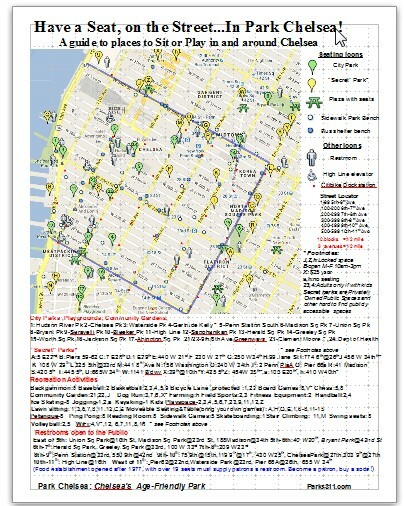 The maps list all public spaces in the neighborhood plus restrooms, Citibike docks and public recreation. The fellow in the middle, Guy, told me that this was the first Citibike ride of the man on the right. The woman on the left decided that it was a good photo opportunity. After four decades carrying millions of New Yorkers, 44 of the city's subway cars are now home to millions of fish. The worn-out cars were dumped on Friday into the Atlantic Ocean, 21 miles off the Maryland coast, to create an artificial reef, designed to attract fish for the state's lucrative sport-fishing industry. Jeff Tinsman, Delaware's reef program coordinator, said a 600-car reef in that state's waters had increased the local fish population by 400 times, and boosted the number of angling trips to 13,000 a year from 300 before the reef was created. The reefs attract fish because they provide protection from predators, and generate food like mussels, shrimp and crabs that quickly colonize the structure. About 95 percent of the seabed off the U.S. mid-Atlantic coast is naturally bare sand, which is much less likely to attract fish, Tinsman said. 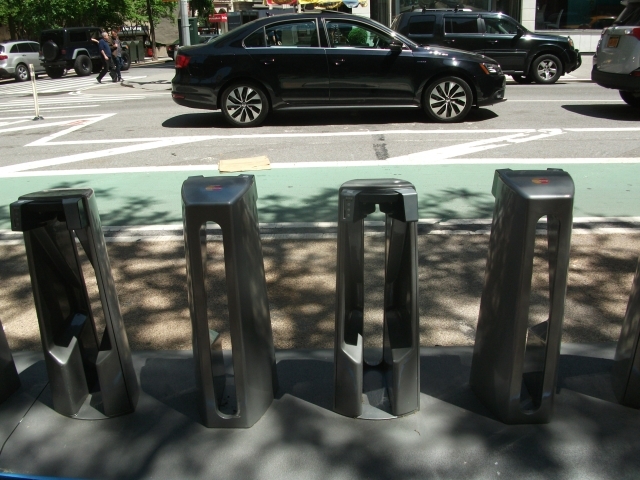 Think of our 300+ Citibike Kiosks as artificial reefs, to attract not fish, but block residents who will colonize the structures. Who will be the first to perform Hamlet in a Citypark? Anyone on a Citi Bike automatically becomes an unofficial program ambassador. 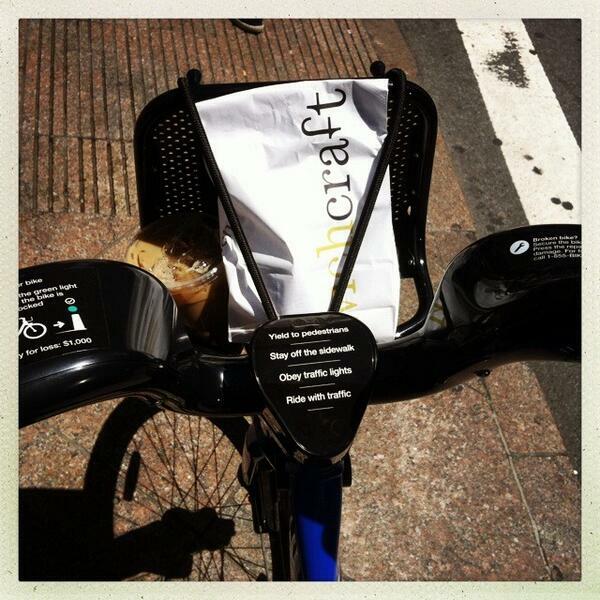 Folks called out questions from sidewalks, taxis and food carts: How's the ride? How does it work? What's the cost? 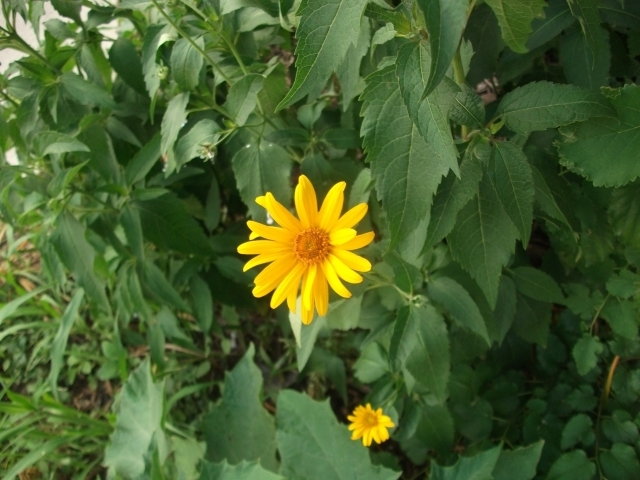 Chelsea Garden Club does a treepit tour every season. If Citibike Parklets are allowed to be artfully customized a walking tour of the unique Kiosks can be offered. Neighborhood blocks that "gussie up" their parklets can join with other blocks that have done so to give a Once a year tour, showing off their handywork. 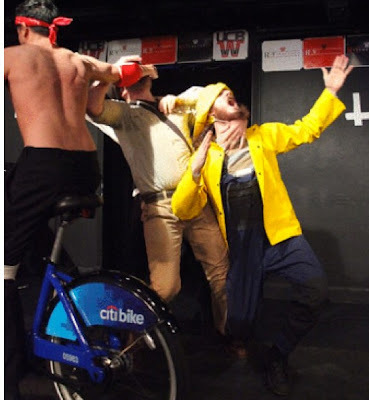 Seating at Citibike Kiosks allows people to be Jane Jacobs's "Eyes on the street"
Just about any performance in the NY Fringe festival, if it was offered as a stand alone entity, would never be reviewed in any major publication. But put them together as part of a fringe festival, and it becomes an event worthy of NYT press coverage. 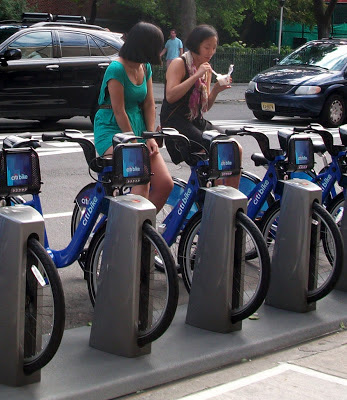 By aggregating events over multiple Citibike kiosks, a similar phenomena can occur. 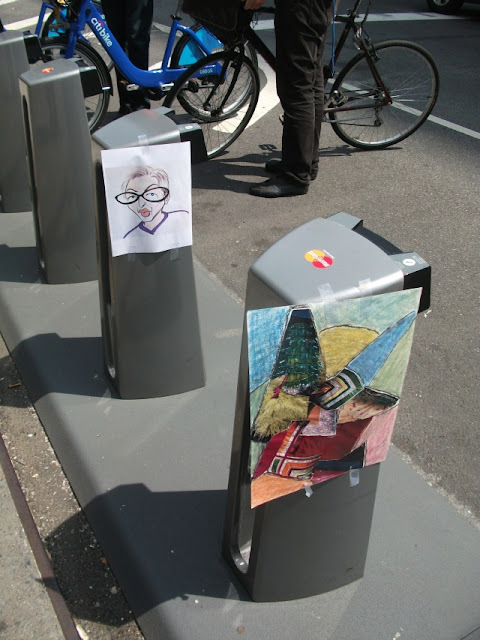 Examples: I have talked to a number of artists willing to exhibit their works at Citibike Kiosks. If say 25 or more Kiosks in a adjacent area were used for an art show, we're talking Citywide coverage of this as an event. Also given the geographic distance of the kiosks, we're talking event+ ACTIVE RECREATION. The Homeless Museum may well be the world's smallest museum. It fits just 2 people. A yearly Museum Fringe Festival offering the Citibike kiosks as museum locations for Homeless Museum sized museum ideas, would be both an event and active recreation offering for both bikers AND walkers. Pictured here Philipe Notradame director Homeless Museum, with Florence Cayote, the Museum director of Public Relations. Designate one or more Citibike Kiosks as Citibike labs. 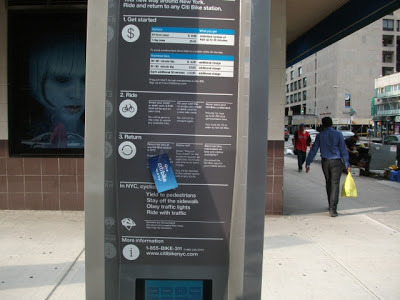 There are a lot of ideas here, some of which are viable, but should be tested before implementation throughout all kiosks. The Citibike labs will be the test locations. 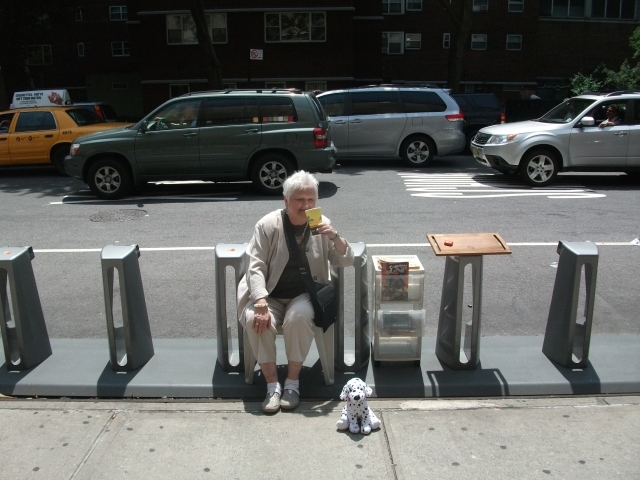 The Citibike docks also help put retired people to work. 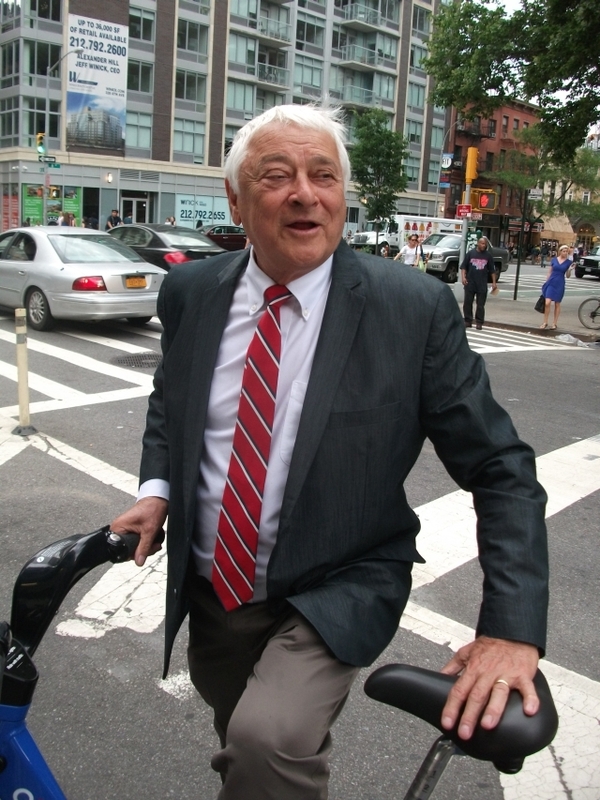 Yesterday I saw recently retired from the State Senate, Senator Tom Duane try to help a neighbor of mine dock a bike that wouldn't dock on 26th at 8th Ave.
As he tried to help her dock I mentioned my idea for seating at the docks, and he said " I'm for anything that creates more seating." 61 Community Citiparks maps distributed at Citiparks. A full Citibike kiosks map is pretty large and unwieldy. A portable 1 page map of the Kiosks around the area you are presently in is easy to deal with. A variation of this ParkChelsea map is what I'm talking about. This is an event. 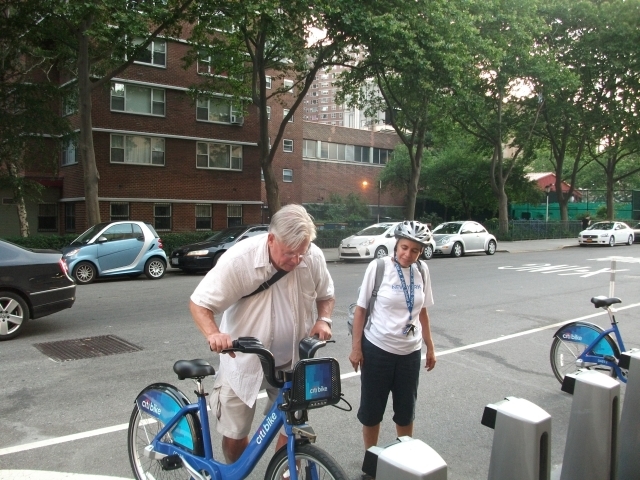 each weekend in a different neighborhood the Citibike Passports self guided tour will be held. Passports will be issued at Citiparks to anyone who wants to participate. Biker or walker. The goal get your passport stamped at as many Citiparks as you can on a given day. for this event refreshments will be served to all. same as above, but with block flea markets happening at many of the neighborhoods Citiparks. 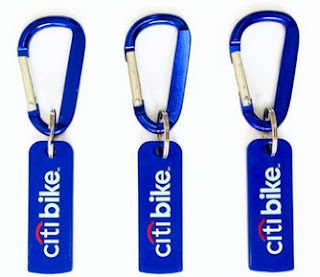 Are there other functions possible for a Citibike key? Yes. The first was discussed above, Restrooms that open only to those who have a Citibike key. 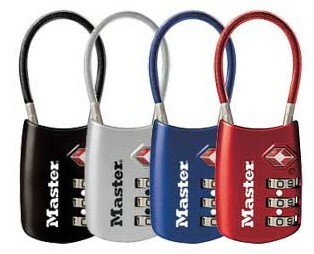 Here's another one , a key for walkers. For instance for walkers who use the Citiparks as rest stops it could record the speed and distance statistics of people who were walkers in the neighborhood much more accurately then a pedometer. On blocks with both a Fire Alarm and Citibike Kiosk, replace the fire alarm boxes with a fire alarm/police call function button at Citibike kiosks. A basket like add on that you can purchase, that will allow you to carry more items on a Citybike than the build in carrier will allow. When our daughter Cameron was born in 2003, we were determined to figure out how to continue commuting by bike. So we purchased a bike trailer. artists, designers and citizens transform Citibike Kiosk spots into temporary public parks! Improv Everywhere is a New York City-based prank collective that causes scenes of chaos and joy in public places. Created in August of 2001 by Charlie Todd, Improv Everywhere has executed over 100 missions involving tens of thousands of undercover agents. 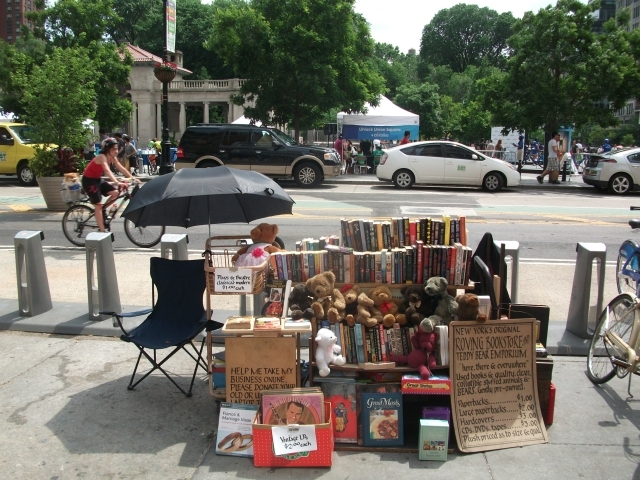 A yearly event, Street buskers will position themselves at Citibike Kiosks around the city. This could happen the same day as parking day, or it could be on it's own day. The Highline , Madison Square Park and other City parks constantly throw events why not Citibike throwing a distributed events series. 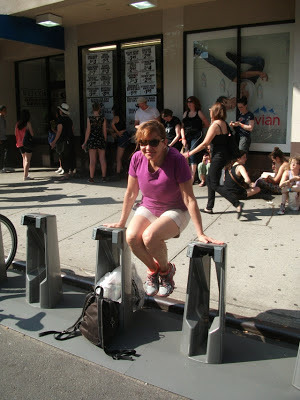 I saw a picture of Christine Quinn posing with Citibike number 2 before Citibike opened. Since it's opened I've been looking if I could see any of the lowest numbers. I finally saw 11 the other day. 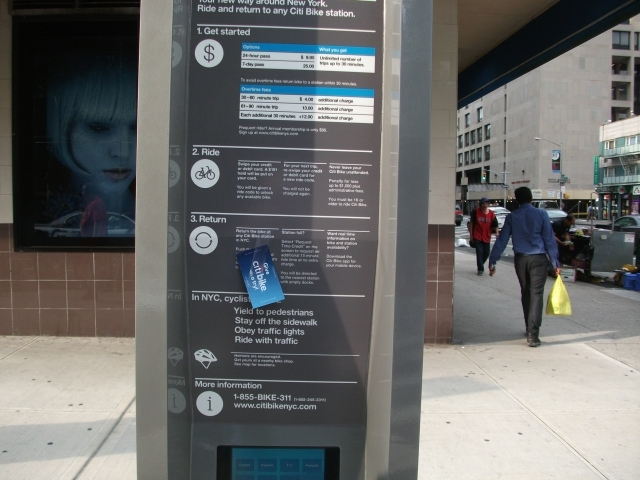 Have a dance company choreograph a dance to be performed at Citibike Kiosks. The NYPL pays groups to put on shows/talks at libraries, this would be a similar deal. When you join you get a Free Ride coupon. 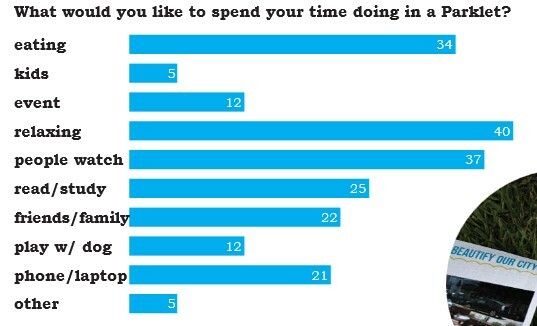 Tape it to a Kiosk. 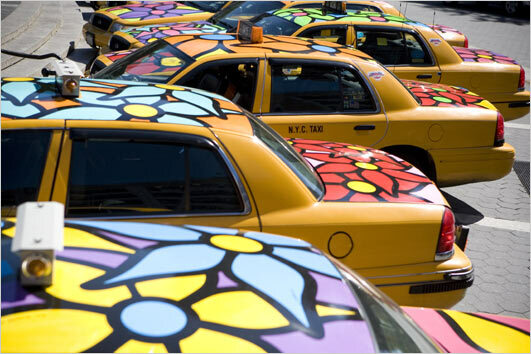 and Al Primo the creator of Eyewitness news, get a to take a free ride from 26th St and 8th Ave to 38th St and Broadway. -A pedestrian version can be used to keep statistics on walkers using the sites as rest stops on "Walking Trails"
Stores have installed Amazon Lockers. 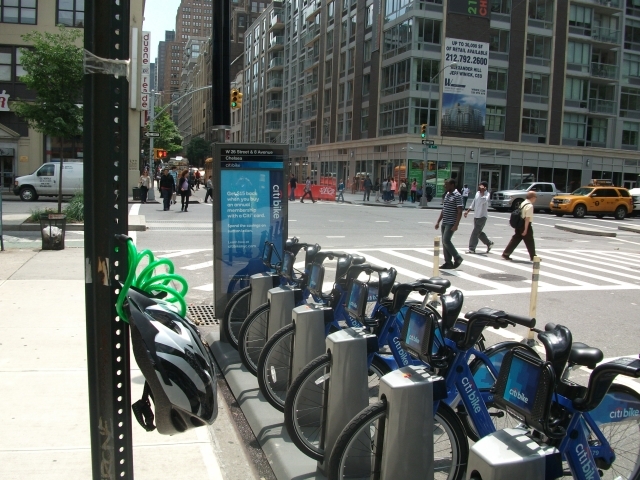 The Installation of Citibike lockers around town would allow users to store their helmets and other items. Bikeststion Santa Barbara allows members access to Restrooms and Showers in a single location.. 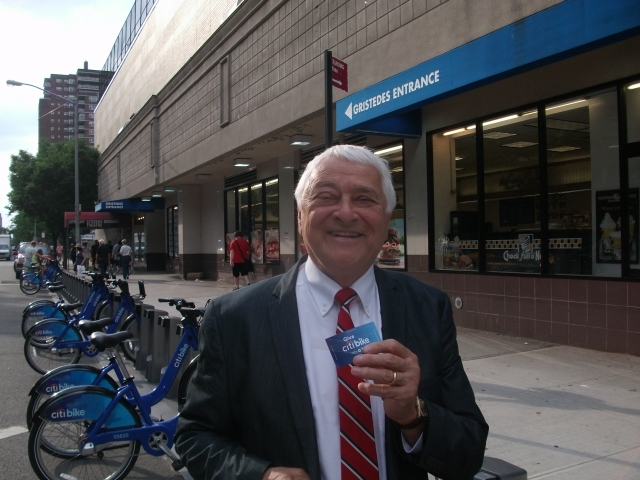 The Citibike key would let Citibike members into shower facilities and Restrooms. Perhaps a deal could be made with health clubs and NYC Rec centers around the city for the shower function. Usually you have to be famous or rich, or do something special to have a site named after you. For the past several years I have been playing the role of Ranger Bob, Park Chelsea Parks Commissioner. This role is performance art and as a work of art I have the First amendment right to informally name sites on a temporary basis.. 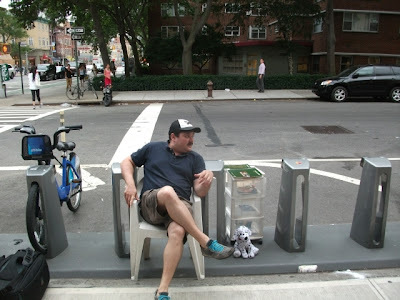 When Citibike Kiosks become Community spaces they will be a natural place to name to honor members of the community either on a temporary or permanent basis. I was walking down 25th street between 7th and 8th Ave when I saw a group of people eating pizza on chairs outside of a brownstone. The kind of scene that happened everyday in the Broom street picture above. I talked with one of the people there, Rafael Orzoco and and learned that he use to live on the block many years ago and for 35 years now, he and other of his friends who lived on the block return once a year to celebrate their time on the block. In the 1950's this block was their park. In those days he said you could play stickball, stoop ball and kick the can on the streets. 35 years from now when all cars are self driving, streets like this will once again be safe enough for people to play stickball on them. Until then those side streets with Citibike Kiosks on them can be at least transformed into a place where neighbors can hang out together without having to bring their own street furniture. Either floating or fixed this would be at several large stations. Sells accessories of use to Citibike users. Ever worry about getting too close to the 30/ 45 minute limit? 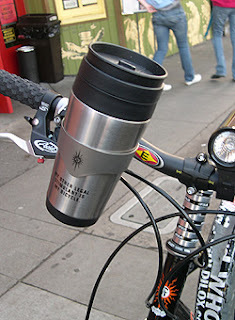 A timer could help..
With everybody around the world either already bike-sharing or about to, we need more accessories to make getting around by bike-share bike easier to do. Whether this means a built-in water-proof seat cover after a drenching rain, a mobile phone charger while you bike, on-bike directions, or a helmet that covers your bald spot so the sun doesn't get through, there are a lot of creative bike-sharers out there who are thinking of ideas to make cycling easier and make a few bucks at it for their entrepreneurial ideas. 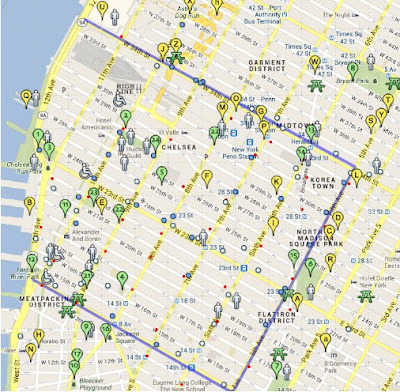 Where is the nearest citibike Kiosk? For those with a smartphone it's easy to figure out. For the rest of us not so simple. Place signage on each street corner directing to the nearest kiosks. Taking #83 a bit further. This epaper wifi sign is used in Tokyo for disasters. During quiet times it could be used for dynamic Bike Share information.Showing a map of stations near the sign that are full or empty. I was on the Broadway Plaza in the 30'saround 8 PM and found that table sand chairs had been moved into spaces where bikes should be docked. Along with the seating at the Citibike Rest stop/community space add a shading attachment to select docks. 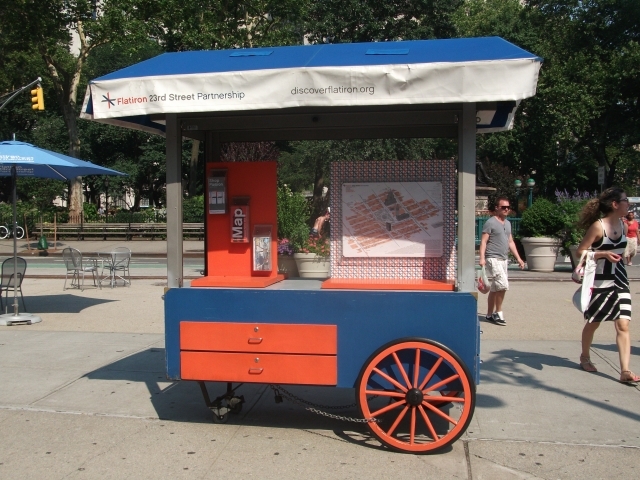 The Flatiron BID offers bike route maps at their kiosk on 23rd and Broadway. Citibike Kiosks are a obvious location to hand these out too. If the docks can be transformed into Microparks that benefited the community would this change? I wpould think in at least some cases the answer would be yes. 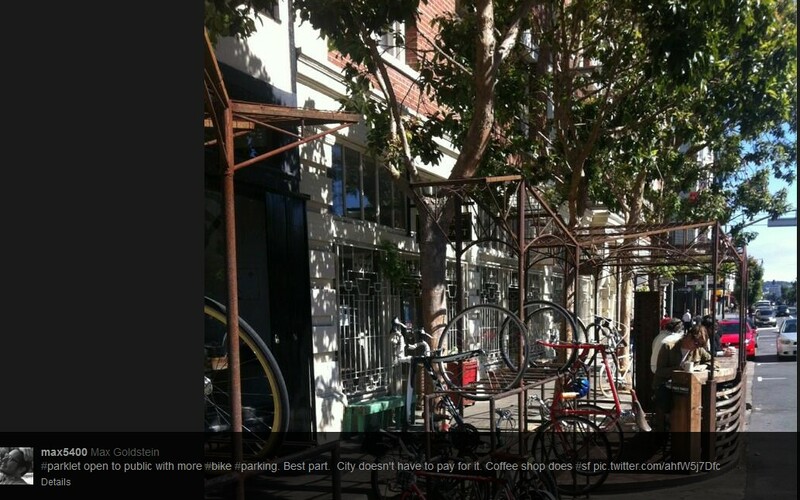 At the beginning of this post there was a picture of a parklet with people and bikes sharing space in some unknown city. 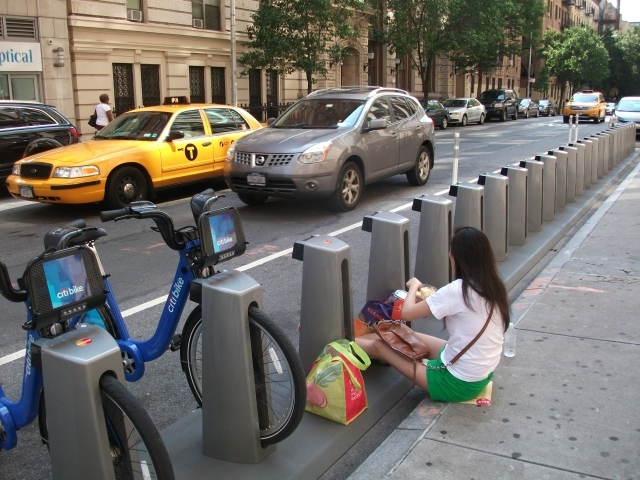 This use intermingles Citibike docking and people sitting, our recommendation is to seperate the two functions. Bike docking on one side of the docks. People sitting on the other side of the docks. 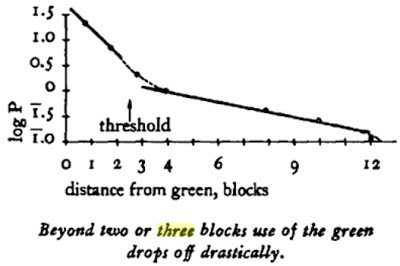 that way there is less interference between the two uses. 93 Stop to catch your breath while carrying heavy items. 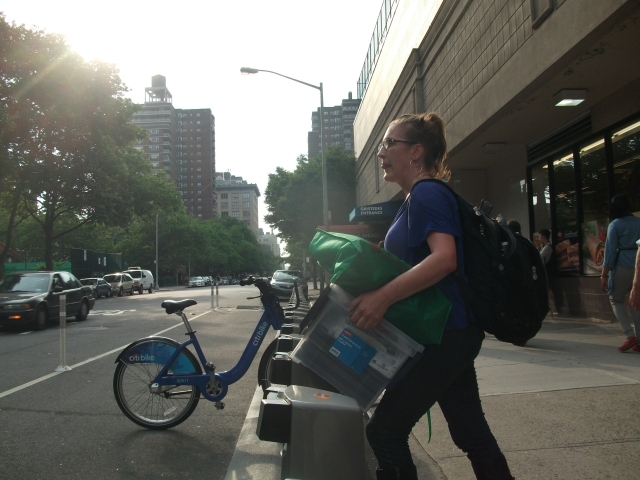 Here Jessica is carrying some heavy items and uses the Citibike docks for a few moments to stop and catch her breath before continuing onto where her car is parked. A 1996 study by David Gray in Pasadena California found that on an average day 150 to 200 seniors were willing to walk 5 minutes to a park to play bridge or pinochle together. 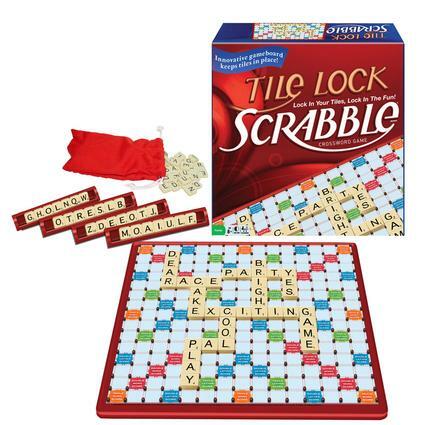 Given a table Travel Scrabble and other windproof board games can be played in these spots too. Across the street from where I live is the Upright Citizens Brigade Theater. They do over 100 shows a month. There is no lobby with seating in the theater, so people have to wait outside and stand or sit on the ground. The theater holds 200 people who land up waiting on line. There are 35 Citibike docking stations here, that can hold either the first 35 people on line, or alternatively anybody who would have trouble standing. I tell him the waiting line idea and that I will be talking to the city about it. Citibikes are creating a more bikeable city through their creation of a distributed biking structure. 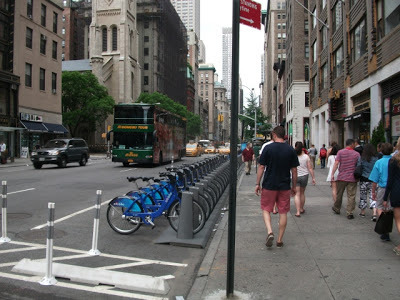 We can use the Citibike Kiosks to create a more walkable city through their use as part of a distributed walking structure. When Chelsea's bike lanes were first put in, the city left practically essentially barren tree pits in the lanes. 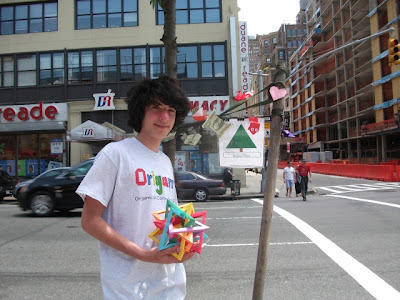 2011:A bikelane tree pit on 25th St and 8th Ave , in the beginning nothing but a tree and some soil. A bunch of people including Missy Adams, Luis Lujan and others transformed the treepits of the bikelanes into community gardens. What happened was taking the bike lanes, an item of no benefit to anyone but bikers, and turning it into a community treasure. 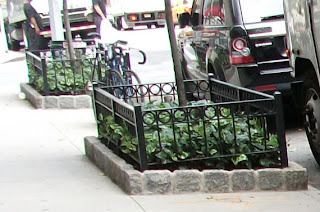 I and several of my neighbors are members of the Chelsea Garden Club, we have a tree pit bike lane garden in front of the building we live in. We know next to nothing about plant gardening, but a great deal about "community" gardening, we have a great time with the garden, mostly talking about it. Actually we've transformed this 6 foot x 6 foot tree pit into the nationally and internationally renowned Thumblina Park and Community Garden. 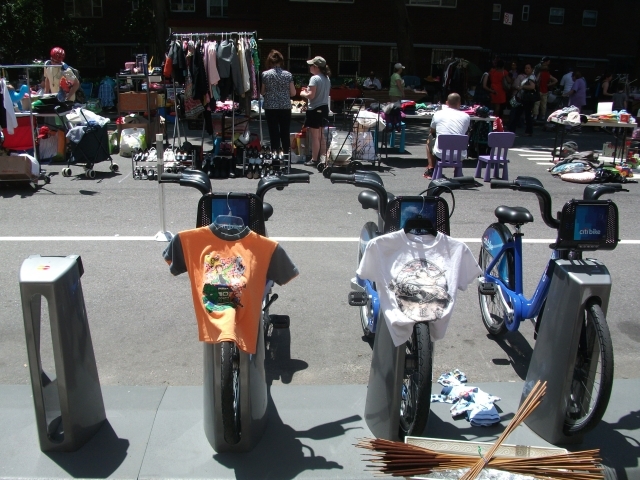 The new Citibike kiosks offer this kind of community involvement opportunity to occur again .For neighbors to get together and transform a piece of their block into a blocks community space. 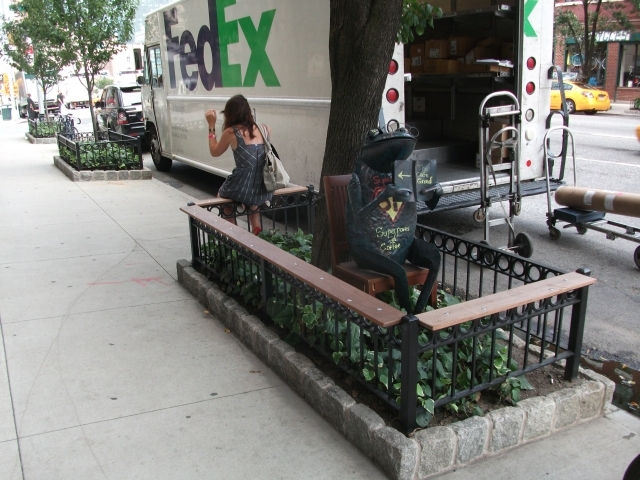 Parklets are generally designed as unique at each location they are placed. This allows for unique wonderfully creative parklets. However each must be designed from scratch and go through a city's approval process for each new one created. For some communities adding amenities like seating to the parklets, could be done as simply as requesting standard furnish modules from DOT. Working this way through City approve furnishings means that no designing or additional approvals will be necessary to get a CitiParklet up and running. Working with a standard form does not mean that these Parklets will lack uniqueness and creativity. For blocks that want to be more creative, custom furnishings and graphics can be done. For example, here are several benches from Rochester's Benches on Parade. working within the constraints of a standard bench form each bench was uniquely customized by the sponsoring group.